It’s the match between the arc rivals. Mumbai Indians takes on Chennai Super Kings in Pepsi IPl 2015. This Friday night will be a blaster. Live Coverage : Sony six (English), HotStar App. Mumbai Indians are looking really trouble at top order. Skipper Rohit Sharma scores double-duck in the previous two matches. This is big worry for them at the top order. Corey Anderson and Kieron pollard looks good with the bat. Their bowling attack really weak at this stage. The star bowler Lasith Malinga couldn’t able to bring his magic so far. Aaron finch, the opener injured last match when try to take a quick single. He missed out today and Lendl Simmons likely to replace him at the top. If all-rounder Harbhajan Singh return to the team that will be a advantage for them. Josh Hazelwood may replace Malinga today. This is a match that Mumbai Indians need to proof themselves as strong contenders of this tournament. 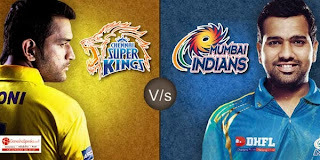 Chennai Super Kings, the team is a absolute power house always very strong contenders. Brendon McCullum and Dwayne Smith opening combination threatens every bowling line-up. Suresh Raina hasn’t show big game so far, but skipper MS Dhoni plays extraordinary cricket at the depth overs. Experienced bowler Ashish nehra looks consistant. Mohit Sharma, Ishwar Panday and spinner Ashwin will be dead combo for the batsmans. Chennai won both of their game. They looking for the hat-trick of victories and they eye to reach the top of the points table. Chennai have to focus to restrict the Mumbai’s middle order they can score huge at the depth overs. Chennai has record of winning more matches than losing against other six IPL teams. But with Mumbai the record is 9 wins and 9 losses. So it will be great challenge for the both teams. Lets see who had the last laugh..men in yellow or the men in blues.. Match Date : 19th May 2015 Match Time : 8-00(PM)(IST) Match Stage : Qualifier-1 Match Venue : Whankhade Stadium, Mumbai. It’s the play-off time. League matches are done,4 teams are set to play the play-offs. Chennai Super Kings, Mumbai Indians, Royal Challengers Bangalore are the teams going to fight in the play-offs. Chennai Super Kings are the top of the table with 18 points followed by Mumbai Indians with 16 points. MI, RCB, RR all have 16 points but MI have advantage of 8 wins in the league make them to move to 2nd place of the table. Bangladesh play exceptionally good cricket in past recent days. They manage to qualify for the ICC 2015 cricket world cup by beating England 2 months ago. They didn’t stop there, they level test series against Pakistan and win ODI series with 3-0. They also won the one-off T20 against them. This will definitely announce cricket world that they are not underdogs anymore. India’s tour to Bangladesh:India all set tour to Bangladesh on this June. India is to play 1 test and 3 ODI’s in Bangladesh. Usually India sends their second grade team to Bangladesh. Past year BCCI send inexperienced team to Bangladesh. However they manage to beat Bangladesh. This time the scenario changes lot. Bangladeshis are ready to take down any challenge. BCCI denies leave request of Virat Kohli and other senior players. They send their real international squad to take Bangladesh. This will show how Bangladesh make them to international standards.